Nā Meka Whaitiri i mana, Parliament Buildings, Wellington. OCTOBER Only! Brazilians Only $30! Save up to $25! Ray says. Progressive Enterprises’ franchise supermarket brands, SuperValue and FreshChoice, have also committed to phasing-out plastic bags as soon as they can. Countdown currently invests $8 million annually to community and environmental initiatives. It has New Zealand’s leading Food Rescue programme, diverting almost $6m annually worth of food to food banks and food charities. YOUR HEALTH IS IN YOUR HANDS Let us help you, phone today! • Immunsation - best protection from some serious infectious diseases. • Female Health - cervical screening every 3 years reduces your risk of developing cervical cancer. • Heart & Diabetes Checks - assess your risk and take action. • Dental care - visit the dentist at least once a year to check for any teeth or gum problems. • Manage My Health - online and interactive, coming soon! and regulatory committee approved the draft policy and gave the go-ahead to consult further with stakeholders and the wider public during October and early November. Public consultation is now open and will run until November 3. The survey and draft policy can be accessed at: huttcity.govt. nz/parking-policy-consultation.
" Buy or Sell? " ""
ing residents’ concerns and the future health of the city. “The reality is we don’t have enough greenfield land for residential development. Our population is starting to grow and this is projected to continue. Last financial year our average house prices jumped more than 23 per cent. Tuesday’s full council meeting heard public comment from established residents concerned with potential effects on their properties ranging from shade cast by new developments through to possible falls in their property values. The Louise Bilderbeck Hall Trust is looking for new help with options open for Wainuiomata people to get involved. New members would assist with management/operations of the hall, as well as help organise and co-ordinate events and repairs. If you are interested, send your CV and a cover letter to Josh.Briggs@huttcity. govt.nz and outline what you would bring to the position. Applications close on October 31, 2017. A Country and Western concert is being held in Wainuiomata this month. The event is being held at Wainuiomata’s Pioneer Church on Coast Rd, and will feature performances by members of the Wainuiomata Country and Western Society. It is free entry, and everyone is welcome. The concert is set to be held on October 22 at 6.30pm.  Dan is raising funds for the Wellington City Mission. To support him, visit wellingtoncitymission.everydayhero.com/ nz/Daniel. 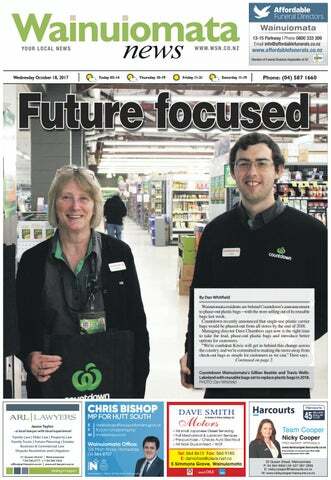  Josh is raising funds for the Wellington City Mission. To support him, visit wellingtoncitymission.everydayhero.com/ nz/joshbriggs. Up for a challenge, the Hutt Urban Adventure Race will be held on December 3 and entries are now open. The event is has been referred to as the Amazing Race meets orienteering, and requires strategy, skills, and stamina. To enter, go to HuttUrbanAdventure.co.nz. Online entries close on November 26. Legal rights at school National youth charity InsideOUT have released a new resource advocating for LGBTQIA+ young people’s legal rights at school. The resource is available for anyone to view and download for free at insideout.org.nz/legal-rights-at-school/. Get your TV reception problems fixed byyour our experts. dream home or an extension to your existing Free TV reception tests on your system home, to ensureayou new office building or a purpose-built have the best possible picture available using our you should employ the services of a workshop, professional test equipment. quantity surveyor. DOES YOU AAHEADAC HEADACHE? HE? DOESYOUR YOURTVTVRECEPTI RECEPTION ON GIVE GIVE YOU DOES YOUR TV RECEPTION GIVE YOU A HEADACHE? W:the www.quantity-surveying.co.nz sfied with results! complete the job: design consultants, architects, engineers, builders, plumbers, electricians, painters, local councils... the list goes on. Maintaining a constant level of communication between all parties involved is imperative to your project’s success. John offers you a complete project management package so you don’t have to worry. With 43 years of experience in the industry, you can rest assured that your next project is in reliable hands. It doesn’t matter how far you are into your project, John can help. If your plan is still just an idea or you are coming up to the home stretch, let John help you get all your ducks in a row. Whatever you need, John is there to make it happen. inbrief news Collection for household waste Hutt City Council is running its Hazmobile collection for household hazardous waste later this month. Hazmobile Collection days this year are on Saturday, October 28, at the Park Street Depot, Upper Hutt and Sunday, October 29, at the Riverbank Car Park, Lower Hutt. Collection times are between 10am and 2pm. Hazardous waste is anything that could pose a danger either to people or to the environment, including batteries, light bulbs, and household chemicals. Children return to school Children returned to school this week and Hutt City councillors are reminding drivers to be mindful of their speeds. Hutt City councillor Josh Briggs says it is important that people slow down around school zones to keep themselves and everyone else safe, especially during drop off and pick up times. Win tickets Win tickets for the afternoon sessions of Wellington folk Festival at Brookfield Labour Weekend! Two double passes up for grabs for the first two people who turn up at the gate with a copy of Wainuiomata News at 4.40pm on Saturday and the same again 4.30pm on Sunday! child care arrangements outside of court. But Wayne stresses that you don’t need to be in formal mediation to take advantage of the parenting through separation programme. “Even if you’re just thinking of separating, we’d encourage you to come along – the earlier you get help, the better it is for you and your children.” Both parents are welcome to attend but are strongly encouraged to sign up for separate sessions. Family Works will be running a Parenting through Separation course in Wainuiomata on Saturday, November 11, from 9.30 am to 2pm. To register or for more information, call 0800 FAM WORKS or email pts@psc.org.nz. ber 1, from 5.15pm to 7pm at The Learning Centre, Level 1, Clock Tower Building, Hutt Hospital. To register, go to afhutt.eventbrite.co.nz. Mon-Sat 11.30am – 9.00pm. Sun 5pm – 8pm. was nothing in Wellington that could accommodate something like Tom & Luke. “Now, we’re proud to be here,” Richard says. Tom & Luke currently employ around 20 people from Wainuiomata – which represents about 80 per cent of its staff. Richard says they had one person from Wainuiomata at the start and then another – from there, whenever a person was needed they just asked those who were already employed. “This is actually the best team; they’re absolutely terrific.” He says it was sort of by accident and word of mouth that the company came to have so many people from Wainuiomata on staff. “And the way we’re going it looks set to double,” Richard says explaining how Tom & Luke was growing. help with the situation. The say that all they want is for dog owners to feel safe and while a dog park wouldn’t completely resolve the roaming dog issue, at least it would be one step closer to making the Wainuiomata community a safer place. Chloe and Lisa currently need 212 signatures to reach the goal of 500.  To show your support or to sign the petition, go to change.org/p/hutt-citycouncil-build-a-fencedoff-exercise-dog-park-forwainuiomata. readers have their say... Find out the WORD on the Street. Question: What are your plans for Labour Weekend? LETTERS to the editor Letters on issues of community interest are welcomed. Guidelines are that they should be no longer than 150 words. They must be signed and a street address provided to show good faith, even if a nom de plume is provided for publication. The editor reserves the right to abridge letters or withhold unsuitable letters from publication. Send or fax them to the address on page two, or email them to news@wsn.co.nz. Please note that your name and street address must also be provided in emails. ’s right – it’s on us! It’s not a draw, it’s our Spring gift to you! P 04 564 7310 E wainuiomata@harcourts.co.nz Promotion applies to properties listed with Harcourts Wainuiomata between 1 September and 30 November 2017. www.wainuiomata.harcourts.co.nz 2.
of the month (if you live at an even-numbered street address). A Wellington Water spokesperson says they advertise that the restrictions have kicked off, so that people know to do the right thing once the weather warms up “hopefully soon” and then they will increase the advertising to help us manage our summer water demand. Keep an eye out for tips on how to be water-wise over summer. Here’s one for starters: check soil moisture levels by digging down about 10cm below the surface. If the soil is moist, you don’t need to water. Visit wellingtonwater.co.nz for water conservation tips and to find out more about garden watering restrictions. tackle anything for you; from aesthetic pruning and shaping to large tree removal. All work is carried out safely and efficiently, while ensuring the greatest care of your property. all-terrain forklifts, these stylish, raised garden beds offer instant satisfaction. Available in three sizes and highly suitable for organic gardening! Kitset Sleeper gardens also available, cut to your specific size. Details on our web page, handystacks.co.nz or call us on 04-979-6990. YOUR ONE STOP GROW SHOP. Bark is a multi-award winning company specialising in the management and care of significant trees, gardens and grounds throughout New Zealand and has been operating since 1994. ENSURE TREES ARE CLEAR OF BUILDINGS AND SERVICE LINES and vigour of the tree. • Tree removal We specialise in removing problem trees in difficult situations • New plantings and transplanting Transplanting and/or suitable new trees for your property. • Large Hedge Pruning Turn your hedge into a master piece. • Service Lines Clearance Power and data line clearance • Stump Grinding Economic options to remove unwanted stumps. Foodstuffs North Island has relocated • Tyres New & Used its Wellington Gilmours store to Bouverie • Wheel Alignment Street in Petone. • Fitting & Balancing Work began on the fit-out of the 4750 • Mag Wheels… square-meter building in June and theOur summer pools were built by us. store was officially opened on October 17.Blends in well did cause no fuss. “Foodstuffs North Island has investedWith hydro slide will cause| aPh:splash. 46 Waione St Petone 5685989 more than $1 million in the developmentAnd to it many people dash. Open Monday-Saturday of this leasehold property, which isThrough native bush we twist and wiggle. located in a light industrial area handyFrom the children brings a giggle. Public Notices to State Highway 2,” Foodstuffs North Severn days a week the place is open. Island’s general manager property Hot summer days we all are hopen! development Lindsay Rowles says. ADVERTISING TERMS & CONDITIONS “The old store in McCormack Place, All advertisements are subject to the approval of Wellington SuburNgauranga closed on October 12 and ban Newspapers. Advertisements are positioned entirely at the option all 71 staff have moved to the new Public Notice of The Publisher & no guarantee of placement is given. Applicable location,”s Lindsay says. loadings apply only to the specific placement of strip or island adver“In this new location we’reDable OF THE AYto tisements. Placement & approval is at the discretion of The Publisher. offer our Gilmours customers a larger, Wainuiomata Squash While every effort will be made to publish as instructed,Club The Publisher more modern store and more parking,” accepts no liability for any loss caused through loss or misplacement. AGM he says. The Publisher reserves the right to reject any advertisement considered unsuitable for publication. Advertisements will be charged on the 51.Gilmours J.K. supplies food and beverages size of the material supplied or the space ordered whichever is the to all different types of New Zealand Rowling 7.00pm greater. It is the responsibility of the Advertiser or Advertising Agent to businesses chose the including restaurants and Monday 30th November notify Wellington Suburban Newspapers of any error within 24 hours cafes, catering institutions, event centres, unusual of its publication. The Publisher is not responsible for recurring erAt the Clubrooms schools and clubs. Wellington Youth Orchestra Karl Jenkins’ Cantata Memoria Deliverers Required in Michael Fowler Centre – Labour Day – 2PM NZ premiere: Youth + Area Momona, adult choirs,1: soloists, WellingtonMohaka, Youth Orchestra, multimedia, under acclaimed NY conductor Jonathan Griffith. Commemorating Aberfan and Pike River mine disasters. Briggs and Barry Councillors, talk Cycle track or maybe walk. Kaponga.Of Hope that it will keep some fit. By cutting down their weight a bit. There is no doubt that it will cost. But few will grudge the money lost. at our recruitment Applications are available office say or atmakes the security gate based in the Completion day they sense. Ngauranga George in Wellington. Could be done inContact two years hence. Barry 472 7987 or 021 276 6654.
from competing under the Wainuiomata Athletic and Harrier Club as he begins tertiary education. Other competitive athletes were offered trips around the greater Wellington region to compete in inter club events, with Wainuiomata having a lot of success. The club itself had a number of highlights throughout the season including hosting the Wellington Road Champs and the Wainuiomata Classic Mountain Run. Athletes are now looking forward to March 2018 when the season begins again.  If you are interested in giving the sport a go, contact Wainuiomata Athletic and Harrier Club president Nikki Braniff-Jones on 021 0234 8292.
which means this type of high stakes game will be no more after the Peru series. Gone too will be the Cinderella stories like the All Whites teams of 1982 and 2010. Gone is the chance to become heroes, the likes of Steve Sumner, Ricki Herbert and Ryan Nelsen. For me, that’s a little sad but hopefully with the potential of an easier road to the World Cup, the national team can play more matches together regularly and improve their skills and cohesion. have grown in popularity with between 10 and 20 people turning up on a regular basis. Wainuiomata classes are taken by Kate Ritchie of Spiritual Graffiti Yoga. “The classes are designed to be beginner friendly – and are for people of all ages.” Rebecca says it was uplifting to read a testimony of a regular participant recently who was happy that the classes were continuing in Wainuiomata after the school holidays and that they loved being part of them from week to week. Classes run for one hour and cost $5 – however, the first class is free. People who are unemployed or studying can also attend the classes in exchange for a koha. “People can just turn up,” Rebecca says.